Oliver (center) with the 2011 cabin of I-6. Good times! Many of us in the North Star world are very curious about Oliver Rockman and his impending college decision. Oliver is a high school senior from Omaha, Nebraska and, not surprisingly, is a fan of the Nebraska Corn Huskers. But he's not your typical fan... Oliver truly bleeds Husker red. He goes to all of the Nebraska home football games. Oliver, however, is considering a multitude of options for where he'll attend college, including other Big Ten schools. As of his last update, Oliver had been accepted to the business schools at Indiana and Penn State and is still applying to Vanderbilt, Michigan, Colgate and USC. 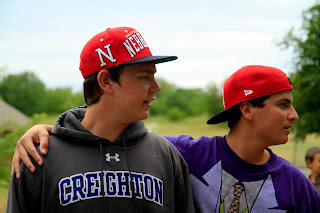 So we are curious to know how Oliver's Nebraska fandom will be effected by going elsewhere for college. We're thrilled to have Oliver back for summer #9. At school, Oliver is involved in DECA and quiz bowl. Oliver will be returning as a cabin counselor and riflery and disc golf instructor. Notable camp memory: Scott laner eating a quart of Culvers custard after a triple butter burger, large fries, and many root beers after our hiking trip. If you had a super hero power, what would it be: The field vision, toughness, agility, determination,and the workhorseness that constitues Rex Burkhead.